That’s right, ladies, I said PIE CRUST. I’m opening strong, gambling that this will not scare off the one or two readers I have straight out of the gate, and I’m doing it because I am not afraid. I grew up in Maine where chowder, baked beans and pie are the holy trinity of soul food and standards for all are ridiculously high. My Grammie Sue taught me to make crust from scratch, and I have even been known to do it from time to time; however, state visits are relatively rare in my house these days, and Anthony Bourdain doesn’t drop by as often as he once did. Generally, the folks I entertain are not what we would call gourmands, especially when it comes to baked goods. As a rule, they find a homemade pie sufficiently impressive to skip over a detailed investigation of what went into it. And I have never had a piece pushed away after one bite accompanied by a moue of distaste and an incredulous pie crust from a mix?. That’s correct. I use a pie crust mix. And on the subject I have two words for you: BETTY CROCKER. The mix, not the book. It is the only palatable alternative to scratch crust, and in my world, unless you’re making lard piecrust – yup, lard as in rendered animal fat – there’s really no point in putting in the effort. In case you’re interested, here’s a good recipe for lard pie crust, though I think you can safely skip over the madness about the wood stove and canning up front. Here’s what you should never do: use premade frozen crusts, buy those vile floppy rounds by Pillsbury (they taste like plastic), make crust using a Jiffy mix (beyond inedible). These are all gag inducing, utterly revolting. Now, with the Betty Crocker crust mix, you do have to roll out the dough, but it’s a pie ferchrissakes, as my angel mother would say, and there’s no way to make a decent one without a modicum of effort. You’ll need a rolling pin, but a wine bottle will do in a pinch. Want to make a pie? Here’s what you do. 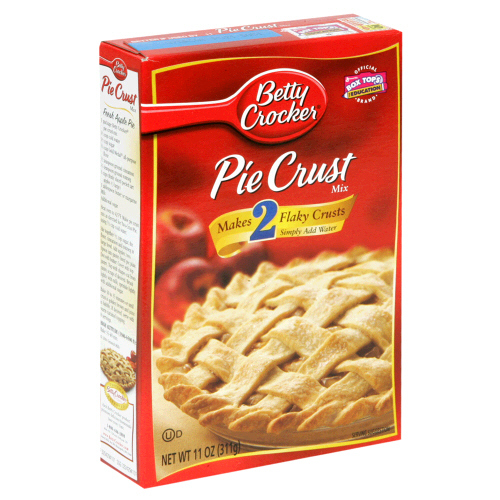 Posted on September 18, 2011, in Baking, The easy way and tagged Betty Crocker, Humor/Commentary, Lard, Pie, Pie crust. Bookmark the permalink. 1 Comment.